The Bring Up Grades "BUG" Program recognizes and encourages students who raise their grades and encourages students. It became a local program under the original chairperson and the leadership of Ed Rochford. 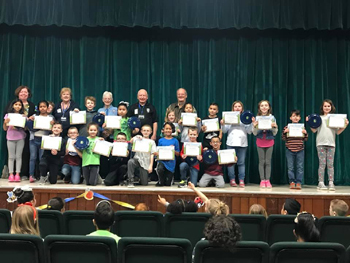 Recognition includes being placed on the school's BUG Honor Roll and presentation of certificates, buttons and other giveaways at a school wide assembly after each full marking period. The program is held at the Cape May Elementary School; the West Cape May Elementary School; Charles W. Sandman Consolidated School; and, Maud Abrams Elementary School. 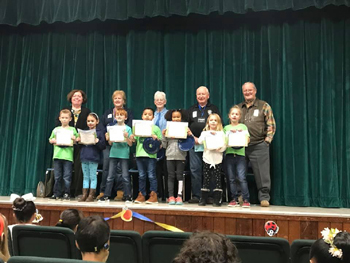 Last week, Cape May Kiwanis Club Members visited local schools (Maud Abrams and Sandman Consolidated in Lower Township, as well as Cape May City Elementary and West Cape May Elementary) to recognize over 400 students who were able to Bring Up their Grades in the popular Kiwanis “B.U.G.” Program. It became a local program under the original chairperson and the leadership of Kiwanian Ed Rochford. Ed spent his career in education in the Essex County vocational school system and retired as a principal in 1987. He was a highly acclaimed basketball official in high school and college basketball and often officiated NCAA tournament games at Madison Square Garden. When Ed retired, he moved to Cape May. His son Jim brought him in as a Cape May Kiwanis member where he quickly got involved with many fund raisers and school projects. One of Ed’s achievements was starting the Bring Up Grades ("B.U.G") program in the local schools and he managed it for many years. He also started Conversation Comrades with Cape May Elementary. Many Cape May Kiwanis Club members volunteered to congratulate and encourage the students at the various B.U.G. assemblies. Some members may be your neighbors including: Kathleen Finley, Program Manager, Eileen Kreszswick, Barbara Caldwell, Paulette Platukis, Barbara Marino, Mary Notch, Larry Notch, Jack Killeen, Jim Ford, Jim Fraatz, Tom Hynes and Bob Morris. The students love the recognition and are motivated to continue with their hard work toward the next B.U. G. achievement. These were the first B.U.G. awards for the 2018-2019 school year and additional recognition will occur at B.U. G. assemblies in April and June. 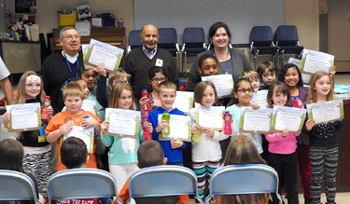 The Kiwanis Club of Cape May under the direction of club member Kathleen Finley presented BUG awards to students who bring up their grades at a school assembly on February 15. 2018. The BUG program recognizes and encourages students who raise their grades. 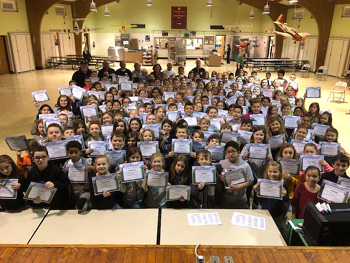 Recognition includes being placed on the school's BUG Honor Roll and presentation of certificates, buttons and other giveaways at a school wide assembly after each full marking period. The club started the program over fifteen years ago. This program was held at the Maud Abrams Elementary school. 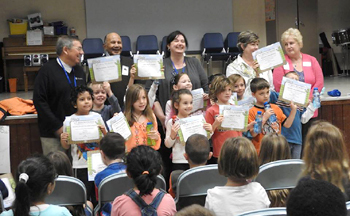 Over 190 students received the BUG award. Additional schools in this year’s program are: Cape May Elementary School; the West Cape May Elementary School; and Charles W. Sandman Consolidated School. Cape May Kiwanis is a licensed charitable organization. The Kiwanis organization’s focus is simple, yet significant; that is to create opportunities for children to strengthen character, improve grades and develop as future leaders through service and Kiwanis sponsored school and college programs; BUG; Conversation Comrades; K-Kids; Builders Club; Key Club; and Circle K. Kiwanis provides local scholarships for six to ten eligible graduating seniors each year. Local fundraising is successful through the car raffle, pancake breakfast and chicken BBQ. 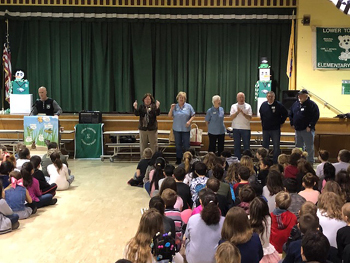 The club members provide community support for the Christmas parade; Easter egg hunt; flag lowering; 911 Ceremony; Cape May City events; and many more community activities.